” Excerpted from Compass official Documentation. 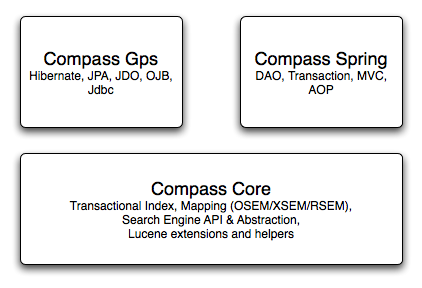 Compass Core is the most fundamental part of Compass. It holds Lucene extensions for transactional index, search engine abstraction, ORM like API, transaction management integration, different mappings technologies (OSEM, XSEM and RSEM), and more. The aim of Compass core is to be usable within different scenarios and environments, and simplify the core operations done with a search engine.Compass Gps aim is to integrate with different content sources. The prime feature is the integration with different ORM frameworks (Hibernate, JPA, JDO, OJB), allowing for almost transparent integration between a search engine and an ORM view of content that resides in a database. Other features include a Jdbc integration, which allows to index database content using configurable SQL expression responsible for extracting the content.Compass Spring integrate Compass with the Spring Framework. Spring, being an easy to use application framework, provides a simpler development model (based on dependency injection and much more). Compass integrates with Spring in the same manner ORM Frameworks integration is done within the Spring Framework code-base. It also integrates with Spring transaction abstraction layer, AOP support, and MVC library. How Google Calculates the Page Rank?